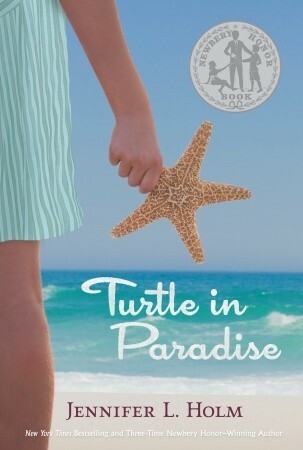 I thoroughly enjoyed Turtle in Paradise! It was entirely due to the title character. From the moment we meet her, riding shotgun next to Lyle Edgit on the way to Key West, Florida, Turtle engages the reader. We remain under her charming spell throughout the story. Whether she is disillusioned by the reality of Key West (as opposed to her mother’s description of it), meeting the overwrought aunt who had no idea she was coming, trading insults with an obnoxious new cousin, feeding the grandmother she thought was dead or offering to earn money by making illegal bootleg runs for ‘Johnny Cakes’ (she doesn’t) Turtle is unflaggingly funny, frank and endearing. Turtle is sent to Key West because her mother has been hired as a live-in maid for a woman who cannot tolerate children. Turtle has never been separated from her mother. She arrives in a small community very different from the one she has known and has to deal with this completely new setting and the separation from her mother. It doesn’t take long, however, for even the toughest, most suspicious of characters to warm to Turtle. Turtle’s name comes from her “ability” not to cry: the impenetrable nature of her “shell.” The reader’s admittance into the rare moments when Turtle does lower her guard have the power to touch our hearts with her young and vulnerable one. Throw in a hunt for real buried pirate treasure and a potentially fatal scorpion sting, a devastating blow in the final chapters, then top it all off with a not-your-typical-happily-ever-after and you have Turtle in Paradise. This book is well worth your time in plot, character and sheer enjoyment. It could easily be a read-aloud or independent read selection. For young readers who may shy away from it at first, mentioning to them that the author, Jennifer L. Holm is also well-known for her graphic novel series Baby Mouse may provide them with the motivation to read this book as well!